If you have stretch marks don’t give up, there is an easy and natural solution to reduce the appearance of stretch marks. Stretch marks are a common problem that affect many: people of any race, any age and any gender. Generally stretch marks appear during sudden changes in body size, such as during pregnancy, puberty, or rapid weight-gain. Ninety percent of pregnant women will get stretch marks around their abdomen, hips and thighs. Stretch marks can initially look like slightly purple or reddish coloured lines that lighten over time become a type of scar. Many people, especially women, struggle with trying to fade stretch marks. Dry body brushing is a natural remedy that can help reduce the appearance of both new and old stretch marks and eventually fading their appearance making them less noticeable. Dry Body Brushing is a very powerful skin exfoliator. It penetrates deep into the pores to cleanse dirt, grime, dead cells and other toxins. It helps to keep the pores open for better absorption of lotions and assists with stimulation of sweat and oil glands, contributing to the restoration of moist, supple skin. Dry brushing also strengthens the skin pores by gentle stretching of connective tissues which stimulates collagen and elastin fibre production. The skin becomes more pliable due to increased moisture and tighter and firmer due to increased collagen. Always use a plant bristle body brush. Plant bristle body brush(commonly called Tampico, Jute or Sisal bristle) provide the best exfoliation and stimulation for your skin. They are high quality, long lasting and don’t scratch the skin. Always brush on dry skin with dry brush bristles. Plant bristles are nice and firm when they are dry, which is why they exfoliate skin and stimulate circulation. When plant bristles are wet they go soft and clump together and you won’t get the same results. Regularly clean your brush. This will prolong the brush life, optimize brush performance and most importantly, reduce risk of bacterial infection on the skin. A lot of dead skin is sloughed off when dry brushing, so it is essential to wash your brush once a week with hot soapy water and leave in the sun to dry or a well ventilated area. Never leave a plant bristle body brush in a wet area, they will mildew. Stroke brush in one upward movement. Except when brushing fingers and toes, you can brush back and forth between them. The stomach you can brush in circular strokes going clockwise and anti-clockwise to really get the circulation moving. We recommend brushing upward and towards the major lymph nodes in the body, such as the groin, armpits and base of neck. Work from left to right, which is the natural direction when massaging the body. Follow dry body brushing with some form of hydrotherapy, this may be a bath, shower, steam room, body mud mask or massage. When you have loose skin after pregnancy or weight loss, keeping it hydrated is an absolute must. Always apply an organic body lotion to nourish and feed the skin, this will help keep it supple and hydrated. For extra healing power to the areas of concern apply organic body oil like Jojoba Oil or Rosehip Oil and massage into the skin. Rosehip is high in Vitamin C which helps to heal scars and reduce the appearance of stretch marks. Hydrating the skin is really important to improve the skin’s elasticity. If your skin is undergoing a lot of stretching it is less likely to tear and create stretch marks if it’s hydrated. While all of these tips can help you, make sure you give yourself time to heal and for your body to adjust to your new shape. Scar tissue can take a while to recover and with the help of this healthy routine your whole body will benefit from the results you achieve from dry body brushing. This Summer has been great for me from the perspective of minimal sun exposure…we have had so much rain that it has only been in the last month that the sun has really had a chance to make an impact. I do sun myself in the early morning and late afternoon – I need the vitamin D and the emotional “shine” that comes from sunshine. But really, I am mostly freckle and sun-damage free. Good news for me however, I have had so many people ask me about skin brightening and preventing pigmentation – what works, is there anything natural, how long it takes and what to do to prevent dark spots and sun damage next Summer? In this blog I am going to review 3 skin-brightening products and discuss how they are best used. I will just note that I use the terms “lightening” or “brightening” with reference to pigmentation only as opposed to lightening the natural skin tone. Prevention/Sun Damage: La Mav Brightening Complex – this product is more effective for evening out skin tone rather than lightening specific pigmentation areas. It is effective for helping to prevent sun damage and inhibiting melanin formation. Use this to prevent damage or for evening skin tone. Melasma/Sun Spots/Small Area Sun Damage: Devita Skin Brightening Serum– this product is specifically designed to help fight the appearance of Hyperpigmentation that is primarily caused by hormones, birth control pill use, chemical peels, waxes etc. SBS works using the natural skin lighteners Kojic acid and Arbutin which work synergistically to help break-up hyperpigmentation, along with Emblica fruit extract, a proven skin lightener, all which help give the look of a balanced skin tone. SBS is applied to small areas or for spot application. One bottle will last up to 6 months. Chemical Peel Discolouration/Large Facial Area Sun Damage: Devita Complex KBA – this is from the Devita professional Rx range. It has been formulated to lighten the appearance of skin, which has been discoloured from chemical peels, age spots, sun-spots and freckles. A cream rather than a serum, it spreads over the entire face rather than being used for spot or area application. Remember any skin lightening treatment takes up to 8-10 weeks to see significant effects. Over the years as a naturopath I have heard some gruesome detox stories from straight water fasts, to the lemon/maple syrup diet, to the grape diet, in which you guessed it, all that is eaten is grapes. The reason I call them gruesome is that more often than not these protocols stress the body rather than supporting it. And when it comes to detox, support is the key. Lets face it, we are bombarded with toxins on a daily basis, from sugary, processed foods full of artificial colours, flavours and preservatives to environmental pollutants, household cleaning agents, off-gassing plastics, modern technology and more (the thought of all those toxins is toxic!). These factors are stressful on the body’s pathways of elimination. To top this with an extreme detox, well it is no wonder people feel awful. From a naturopathic perspective, the primary aim of a detox is to promote elimination by reducing the toxic load and supporting the organs involved so the body works more efficiently and is able to clear the toxic backlog more effectively. Stressing the body doesn’t make the job of elimination any easier. Giving the body a break does, particularly if done in a gentle, supportive way. Dry Body Brushing – this stimulates the blood and lymph to flow ensuring the toxins don’t stagnate in the body, rather that they are moved out. Drinking a detox tea – herbal teas have two important roles. Firstly the herbs support key organs such as the liver and kidneys and secondly, they are in a base of water which helps flush out toxins via the urine. Look for herbs such as Dandelion, Calendula, Red Clover, Nettles, Green Tea and Peppermint. Detoxes can be a simple as above or incorporate more specific aims (these are generally put together with your naturopath) and the benefits are many including feeling healthier, sheding a few excess kilos, and ultimately help your body process and systems of elimination work more effectively. We are very proud to announce Plant Ark endorsement of Pure & Green Organics products. Endorsed products will be clearly identified with the “Proudly Endorsed by Planet Ark” logo. Look for this logo on individual products. “Our endorsement means consumers can now buy quality beauty products whose environmental claims they can trust without worrying about “greenwash” and false claims”, says Paul Klymenko, Planet Ark CEO. To gain the Planet Ark endorsement Pure & Green Organics was evaluated against four criteria – its environmental impact, health, quality and cost. This confirms that products don’t impact the environment, do not contain synthetics or petrochemicals, have the highest quality ingredients and offer maximum value for money. “Our aim is to create one of the world’s most sustainable, truly organic beauty brands. Both the ACO bud logo and our new Planet Ark endorsement shows that we have become pioneers in the cosmetics industry,” says Grace Culhaci, founder Pure & Green Organics. Planet Ark is an Australian not-for-profit Environmental organisation, founded in 1992. Plant Ark is non-political and is not aligned with any political party. Well-known for planting 15 million trees for its National Tree Day Campaign, and the Recycling Near You programme promoting the recyclability of household items via celebrity ambassadors. The Planet Ark Environmental Foundation aims to work with people and business to teach them the simple ways in which they can reduce their impact on the planet, at home, at work and in the community. Planet Ark is largely funded by corporate sponsorship working in partnership with businesses and organisations that want to help bring about real environmental change. Buy purchasing endorsed Pure & Green Organics products a percentage of the sale goes back to Planet Ark to allow their wonderful educational work to continue. While New Year is the traditional time for giving up habits and setting goals, I decided to start early and once again gave up my daily coffee. This has been an ongoing issue for me for many reasons. Firstly I have a dairy intolerance so after 10 years of drinking milky lattes, I finally gave up dairy and my hormonal breakouts magically cleared up (my recent icecream indulgence has seen new breakouts so I have backed off again). This saw me drinking soy lattes for all of one week until I declared that there was nothing so disgusting that soy milk – for me anyway. So to black coffee and my addiction switched from mid strength lattes to super strength long black coffee with sugar. I found myself needing my daily cup and getting irritable if I didn’t have it. Sometimes I didn’t even want coffee at all but drank it anyway. Finally one day recently when I found myself forcing down a coffee I didn’t want out of habit, I decided to give it a miss entirely – well for a while at least. So I did for exactly 4 brain-fog filled days. On day 5 my brain felt so foggy, I had not one but two mega strength coffees and drove home from the coffee shop with hands shaking and vision blurring. Not only was my heart racing but much to my dismay my skin went all blotchy. From a Traditional Chinese Medicine perspective this is due to the heating effect of coffee and if heat builds up in the body (from too many coffees) or isn’t eliminated effectively (poor digestion) it held in the body and can result in red, blotchy skin. Other foods that have this effect include alcohol, spicy foods and hot drinks. This is one of the reasons that those with rosacea tend to react to these foods so badly. This is not to say that coffee is bad, just that for most people having it in moderation is a good idea and for those with rosacea or those adversely affected by “heating” foods, going without it better. And so for the sake of my skin, which is a refection of my inner health, I have come to the point now that I can have coffee occasionally rather than every day. When I do have it I REALLY enjoy it, when I don’t I don’t miss it too much! Black and herbal teas are a thirst quenching replacement. What we eat can certainly have an effect on the appearance of our skin. In my case firstly dairy and then “heating” foods or drinks. However, knowing what affects your skin in these ways can be the hardest thing to work out. A full elimination diet is a comprehensive way of finding out which foods affect you and how but can take a long time and are often quite difficult to sustain. You can shortcut this process. If you suspect you may be reacting to a particular food, it is worth testing your theory by taking the food group out of your diet completely for at least 3 days. Then test yourself by having a serve of the food and noting how you feel. Any number of symptoms may arise including: digestive issues, mood swings, irritability, energy drops, headaches and many more. A good rule of thumb is that if you feel rotten after eating the food it is worth minimising its inclusion in your everyday diet. Are there any experiences that you have had with diet and skin issues. Please share them and what you did about it with our readers as it may be the very thing that helps someone else. “The vitality of internal organs, working properly, transcends your skin and brings radiance to your face.” Dry brushing your face with soft plant bristle can rejuvenate tired, dull skin. The first layer of the skin, the one you see, is called the epidermis. The epidermis is composed of several layers of cells; the outermost of them is made of dead skin cells called the horny layer. Experiments with human cell cultures show normal cells stop dividing when they touch their neighbours. Consequently, to speed up the process of the reproduction of new cells, dead cells must be removed. That is why regular exfoliation can make the world of difference. Exfoliation is one of the most important parts of a beauty regimen. Exfoliation rejuvenates skin when dead skin cells are removed, energizes your skin and improves circulation. All of these combined result in a better looking complexion. Dry facial brushes are very effective at exfoliation, increasing circulation and draining away lymph congestion around the nose and eyes, relieving stress around your temples. The bristles have to be a soft plant bristle, like Jute. Jute is a very fine plant bristle that is delicate enough for the skin around the eyes but still very stimulating to drain away puffiness. The facial brush must not be harsh on facial skin, as it is can scratch and damage the skin. Bristles like Boar’s hair, coconut plant, Tampico plant are not suitable for delicate skin. Most people dry body brush on their bodies but forget about the face. Gentle manual facial brushing will speed up cell turnover, maximize oxygen intake, strengthen the skin’s inner structure and reverse the effects of aging. The key is to use an organic moisturizing cream after brushing and to regularly use a Hydration Mask or Facial Oil 1-2 week to keep good hydration because the dry face brush exfoliates really well. + Use gentle upward movement to lift the facial muscles and lightly curve brush down to finish with a light brush stroke. It is in an upside down U shape. Light pressure up and soft stroke down. Brush approximately 7 strokes per area. + Starting from left to right side of face, work your way up the face from chin, lips, cheeks, side of nose, up around the eye lid and forehead. + Be careful never to stretch the skin. The first couple of months be extra gentle, the sensation should be pleasantly stimulating. + Stop immediately if it doesn’t feel good or your skin has an allergic reaction. +Starting on left side hold brush just above breast line and brush upward to collarbone. Working from mid to outer décolletage. Repeat this on the right side. Brushing approximately 7 strokes per area. +From left side, at the back side, base of neck very lightly brush up to the jaw line and curve down to the collarbone, the point at which the head and neck drain into the lymph nodes. Repeat 7 times. Then starting at base of neck brush up to chin, cover the neck. Repeat on right side. + At first the whole procedure should only take about a minute, gradually increase the time to a couple of minutes for a great massage to the face. +Recommended to dry brush 1-2 per week to begin with until your skin gets use to dry brushing. A lot of skin is sloughed off when dry brushing the face and décolletage so it is essential to look after your skin with a good moisturiser and use a hydration mask or facial oil 1-2 week also. You will notice an amazing improvement to your skin, increase skin tone, beautiful sheen and more hydrated. Sensitive skin is something I have had to manage since my teenage years, and while I manage it well now, for a long time it was with varying degrees of success. I am not alone though, with up to 40% of people describing themselves as having sensitive skin and many more reporting an adverse response to a personal care product at some stage. From a dermatologist perspective, the term “sensitive” refers to those with skin that reacts or is intolerant to the use of some or many cosmetics. Sensitive skin can occur in all skin types however, it is more commonly found in women than men and often those with delicate or dry skin and a tendency to flushing. As well as reacting to cosmetics, sensitive skin can also react to environmental factors such as cold or hot temperatures and wind or sun exposure. While there is no sign of inflammation, sensitive skin is commonly associated with burning, itching, stinging, dryness and redness or feelings of tightness. These reactions can be intermittent or permanent and vary in intensity. Where inflammation is present (welts, hives, raised red skin or lasting redness) it is important to consider an existing underlying skin condition such as dermatitis, rosacea or a contact allergy in which case cosmetic ingredients need to be assessed. Usually a challenge using the suspected product will pinpoint the cause. In the case of a skin disorder, managing the condition is a priority as well as removing suspected cosmetics. As an advocate of natural and organic skin care, I am not surprised by the number of skin irritations that occur when using cosmetics with synthetic and in some cases potentially toxic ingredients. I will go into ingredient details later however it is important to be aware that natural skin care ingredients can also cause skin irritations for those with sensitive skin. Essential oils, particularly low-grade essential oils are also a common culprit. 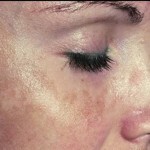 If you have sensitive skin it is important to find out what the triggers are and to avoid them. 1. Reduced barrier function – if the barrier of lipids (acid mantle) is compromised the skin is less protected against chemicals, irritants and microorganisms and there is chance of greater Trans Epidermal Water Loss (TEWL), increasing the likelihood of dehydration. Skin that is dry, dehydrated or injured has less nerve end protection which continues the cycle of sensitivity reactions. Once this cycle is in place many cosmetic ingredients can cause irritation. Listed at the end of the article are the common cosmetic triggers. function. Rosehip, sweet almond, tamanu, jojoba and evening primrose oil are all rich in essential fatty acids (EFAs) which help repair skin cell membranes and as such water holding capacity. While not specific to all people with sensitive skin, EFAs will also dampen down skin cell inflammatory responses. Avoiding products such as cleansers and shampoos that contain sodium laurel sulphate and like foaming agents is also crucial as they will aggravate skin dryness and further reduce barrier function. In one clinical trial, participants with reduced barrier function avoided all foaming agents (surfactants) and minimised preservative use. After 8 weeks their skin returned to normal barrier function. 2. Skin Trauma – skin traumas, such as sunburn and skin treatments like chemical peels and abrasion can cause ongoing sensitivity. Strong acids such as those found in glycolic acid peels have been known to cause lasting skin sensitivity issues. If the skin barrier function can be repaired, then sensitivity may be reduced however it is likely that cosmetic ingredients with a stronger acid pH will have to be avoided or used with caution. These can include further glycolic acid treatments, lactic and malic acid, vitamin C serums with concentrations over 10%, alpha and beta hydroxy acids. 3. Environmental factors – extremes of cold, heat (including heaters in winter), air conditioning, alcohol & spicy foods can be triggers and should be monitored and avoided if relevant. 4. Stress increases the likelihood of heightened neuro-sensory reaction in the skin. In situations such as this wind, touch and cosmetic brushes can cause irritation or redness. Managing stress can be quite individual and often required internal nervous system support as well as de-stressing practices such as yoga, breathing exercises or meditation. 5. Allergies – true skin allergies arise from immune system dysfunction. These include eczema, hives, rosacea and contact dermatitis. Patch testing can help confirm these conditions to establish if these conditions are contributing to sensitive skin reactions. Hypoallergenic and “unscented” products are often recommend as a solution to sensitive skin however, just because you can’t smell the scent doesn’t mean that fragrances weren’t added or that fragrance-like substances weren’t used. Often subtle fragrances are used to cover up the scent of the base ingredients, so you don’t smell anything you would identify as a scent but it is still there and is likely to cause irritation regardless. 5. Use non-soap cleansers for at least 2 months. Soapwort based products and cream cleansers are ideal to give the skin a break. 6. Use tepid water to wash your face and avoid hard scrubs and they may increase irritation. Kakadu Plum – a patent on Bush Tucker? A bush tucker food native to the Northern Territory and Western Australia has raised the interest of a major US cosmetics giant. Last year Mary Kay cosmetics applied for an international patent on the Kakadu Plum extract to be used in skin care products. Traditionally used for food and medicine by the Mirrar people of Kakadu, this patent would create a monopoly of use for Mary Kay for up to the next 20 years. There is concern about this patent application as it may limit future use of similar extracts and indeed may exclude the use of Kakadu Plum in existing cosmetic products. The application had also angered some indigenous people as it doesn’t take into account any benefit sharing for traditional use of the plum. Also known as Billygoat plum, the round, light green fruits are usually eaten raw or made into jam. The fruits gained increased popularity after the vitamin C content became known. Significantly the Kakadu Plum has been identified world wide as the single natural food source with the highest vitamin C content on the planet. It contains up to 3000mg of vitamin C per 100g of fruit, which is over 50 times the concentration found in oranges. In addition high levels of folate and polyphenolic antioxidants were also found. Unfortunately, supply of high-vitamin C content Kakadu Plum may be limited. Antioxidant levels including vitamin C respond to harsh growing conditions and rise when the plant is under environmental threat which is common in wild stands of trees. Plantation crops of the fruit have lower levels of vitamin C due to irrigation and less harsh growing conditions. The vitamin C content in particular explains why it Kakadu Plum has gained the recent interest of Mary Kay. Among other benefits Vitamin C – supports and stimulates collagen synthesis and reduces free radical damage. Significantly in the Australian climate, it also minimised photoaging. Photo-aging damage includes but is not limited to: wrinkles, dark blotches, freckles, leathery texture and loss of elasticity. This exceptional extract can be found in the Mukti range, in particular their newly reformulated Nourishing Facial Cream as well as the divine Kakadu Plum & Honey Gel Hydrating Mask. Pisum Sativuum is an extract from the leguminous Pea plant. The molecule stimulates the production of collagen and elastin and protect the dermal and epidermal proteins which directly impact on skin firmness and elasticity. This is considered an “anti-wrinkle” active ingredient. Hibiscus Esculentis is another active constituent wihci is rich in oligopeptides. They have a “botox-like” activity on the skin by naturally relaxing the muscle. This directly impacts by smoothing expression line sand slowing down the deepening of expression wrinkles. Natural Active Acacia gum – An exudate obtained from stem and branches of Acacia tree. Acacia tree plantation reduce deforestation and desertification; helps local actions integrated in a Sustainable Development program. This ingredient provides an immediate tightening effect so is great if you have an event or wake up on the wrong side of bed as it will help to smooth skin. The other ingredient that has the same immediate tightening effect is Argania spinosa extract which also has a longer term biological effect particularly on neck wrinkles. A few ranges are taking advantage of these ingredients, including them in new cosmeceutical ranges. In particular, La Mav has a focus on sustainable plant extracts that have anti-aging effects but are also good for your skin by being organic & natural. So from the La Mav range for an immediate tightening effect, go for Line Perfector and as a complete treatment serum, choose Line Smoothing Serum. So when can you start to see results? Your skin should start feeling soft and supple very quickly, within 1-2 days. If you are using products with Acacia gum or Argan you will see immediate effects. With continued use you will start noticing the positive changes in your skin within 1-2 weeks. This month (August) with any phone, mail or internet order you receive a complimentary La Mav sample and $10 La Mav dollars to use with your next La Mav purchase. View the La Mav range.